I thought I’d ride out to Deception Bay this morning. To make it interesting I cut through North Lakes, and found a couple of dirt tracks at end of Discovery Drive, North Lakes, which helped me get there from the South-West without having to navigate some of the major roads in the area. It’s Australia Day today and at the waterfront, all the BBQ’s and picnic tables were taken – even at 9am. 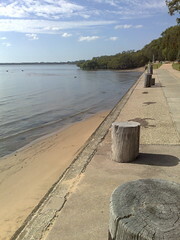 I’m not surprised because it’s very pretty, with great views to Scarborough, Moreton Island and Bribie Island. 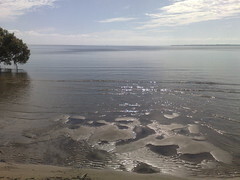 Deception Bay was initially named Pumicestone River” by John Oxley in 1823. When he realized it wasn’t actually a river, he named it “Deception Bay” instead. 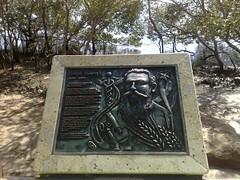 Poor John Oxley had more than his share of “deception” in this area – being led up the North Pine River by shipwrecked convicts Finnegan and Pamphlett, who told him it was the Brisbane River. 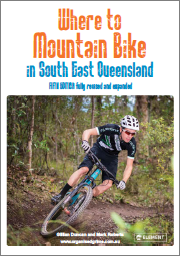 When he realized it wasn’t the Brisbane River, he named it “Deception River”, but “North Pine” river eventually stuck because of all of the Hoop Pines that grew along the river’s banks. 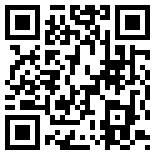 Dr Joseph Bancroft was doctor and scientist who settled in the Deception Bay area in the 1860’s. 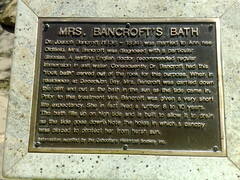 He is famous for his studies in parasitology, but one of the more touching memorials in the area is “Mrs Bancroft’s Bath”. His wife was diagnosed with an illness which doctors suggested could be mitigated by bathing in salt water. 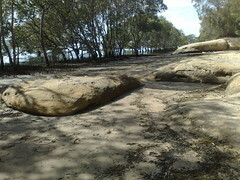 To make this easier for Mrs Bancroft, Joseph had a bath carved out of one of the large rocks on the foreshore. At high tide, the water would fill the bath, and Mrs Bancroft would be able to take her saltwater bath with ease. As you can see from the picture, the bath is still there as a testimony to one man’s love and care for his ill wife.